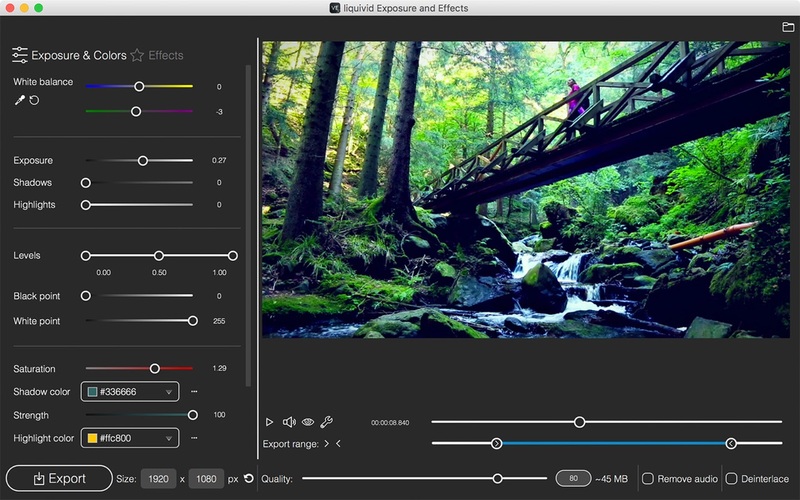 liquivid Video Exposure and Effects 1.0.13 – Tune up videos and photos quickly and easily. Liquivid Video Exposure and Effects is an easy-to-use app that allows you to change a clip’s exposure, saturation and white balance and apply different visual effects (also known as filters). Imports all common video formats and codecs in any resolution (including HD, 2K, 4K). Next story Theme Lab 5.4.2 – Beautiful themes for Keynote. Previous story iNet Network Scanner 2.6.2 – Displays info about local network connections. Serviio 1.5.2 – Stream music, photos and video to PS3, Xbox 360 and more. Wondershare Filmora 8.2.3 – Video and photo editing. iFFmpeg 5.5.8 – Convert multimedia files between formats.